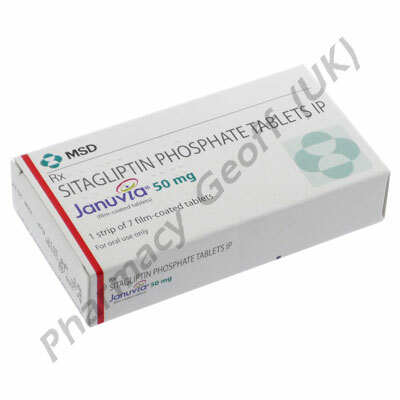 Januvia 50mg (Sitagliptin) is a treatment for type-2 diabetes (non-insulin-dependent diabetes). It is prescribed in situation where blood sugar levels cannot be controlled by diet and exercise alone. 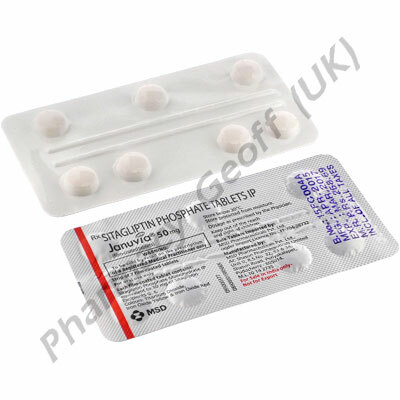 Sitagliptin is a DPP-4 inhibitor (dipeptidyl peptidase-4 inhibitor). Januvia improves insulin levels after meals and decreases the amount of sugar produced by the body. Januvia works primarily when blood sugar levels are high, so it is unlikely to cause hypoglycaemia as other diabetes medications can. Januvia comes in a pack of 7 x 50mg tablets. 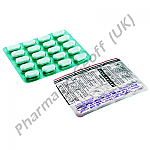 <1 href="https://www.pharmacygeoff-uk.md/Januvia.html">Januvia 100mg Tablets are also available. Januvia is once-daily oral tablet. Swallow the tablet whole with a glass of water. It can be taken with or without food. Your doctor will prescribe you a dosage. Make sure you take this dosage as prescribed. Most side effects of Januvia are mild and temporary. The most serious side effect it can cause is pancreatitis (inflammation of the pancreas). Other side efftecs amy present if yoif you are also taking other diabetes with Januvia. Tell your doctor if you are taking insulin, pioglitazone, metformin, rosiglitazone or sulfonylurea medicines. Tell your doctor immediately if you notice an allergic reaction to Januvia, or if you otherwise feel unwell when taking Januvia. Januvia is for treatment of non-insulant-dependent (type-2) diabetes only. It is not used to treat type-1 diabetes. Tell your doctor if you have had diabetic ketoacidosis (increased ketones in the blood or urine) or any kidney problems. This can cause complications with Januvia. Januvia is not recommended in pregnant women or women who are breastfeeding or planning to breastfeed. Januvia can cause pancreatitis (inflammation of the pancreas) is some people. This can be a very serious problem. Tell your doctor immediately if you feel stomach pain while taking Januvia.